Stretching is very important before you shovel snow. Stretch in the same way that you would be for going for a bicycle ride or even a run. After you are finished with your stretching, be sure to dress warm with many layers so that you are comfortable while outside of your home. Pay close attention to where you are shoveling the snow. For instance, you never want to shovel snow two times if you can prevent it. Move snow the furthest distance first. This way, you can get the job done faster and get on with your day. It may sound like a strange idea. However, if you can start in the center of your driveway and work your way out, you are going to have less work ahead of you. Push snow directly in front of you from all directions while standing in the center of your driveway. This is only going to give you half as much distance to move the snow from your home. 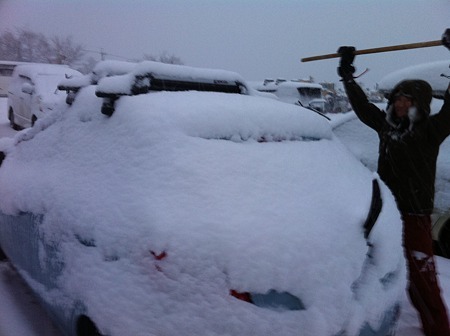 Make sure that you remove all of the snow from your cars before you begin shoveling. Otherwise, you will be doing the job twice. Work in the foreground of your driveway before you move on to the background. Use your legs and your shoulders when lifting heavy snow. This is going to prevent a lot of strain on your back. Never twist your body when throwing snow. Instead, turn your entire body so that you do not pull a muscle. Even though the weather is cold outside, make sure that you have a bottle of water with you. Believe it or not, that cold water is going to taste awfully refreshing once you begin sweating. You may even consider putting the bottle in a pile of snow to keep it cold. You may not believe how heavy snow can actually be. Because you are giving your body and extreme workout, it is important to take breaks in between shoveling. There is a good chance that your neighbors are outside doing the same thing. This will give you the opportunity to visit with them. Do not worry about every little spot of snow. After the sun comes out, it is going to melt anyway. As long as you follow these tips, your snow shoveling experience around your home will be much easier.